These family photos and first birthday photos in natural light on the beautiful beaches of the Jersey Shore have me swooning! This is the same place we photographed Sara and Jamie's maternity photos and they are back with their one year old daughter, Hayden! I love the soft colors they wore, their outfits went so perfectly withe the scenery! Hayden was full of smiles and loved eating the sand..lol. Maybe even more than the cake! 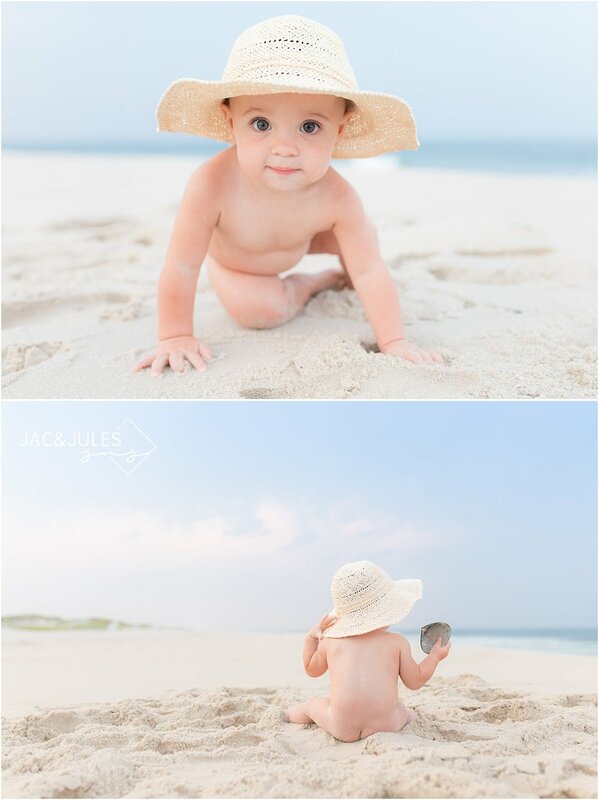 Towards the end of the session we had gorgeous blue skies and used her adorable little beach hat. Gahhh I love them all! Take a look at some of our favorite photos of the perfect little family in beautiful natural light on the beach! Do you have a favorite? Let us know in the comments! INTERESTED IN BOOKING A SESSION OR TALKING ABOUT YOUR WEDDING? WE SHOOT ON LOCATION PRIMARILY USING NATURAL LIGHT AND THE RESOURCES AROUND US AND WE TRAVEL ALL OVER! WE PHOTOGRAPH PRETTY MUCH EVERYTHING FROM FAMILY TO MATERNITY AND BABIES, TO ENGAGEMENTS AND WEDDINGS. CONTACT US HERE!